sparQ DNA Library Prep Kit is intended for molecular biology applications. This product is not intended for the diagnosis, prevention or treatment of a disease. 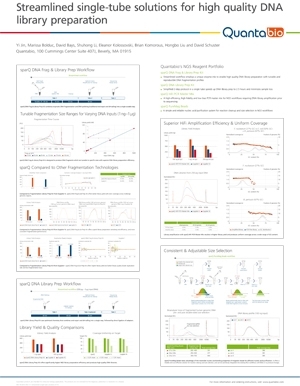 sparQ DNA Library Prep Kit is optimized for the rapid construction of DNA libraries from fragmented double-stranded DNA for sequencing on Illumina® NGS platforms. The simplified protocol speeds up library prep to 2.5 hours with minimal hands-on time and accommodates DNA input amounts from 250 pg to 1 μg. DNA polishing reactions are streamlined into a single step to convert fragmented DNA into 5'-phosphorylated and 3'-dA-tailed DNA fragments. This is followed by high efficiency adapter ligation in the same tube. PCR-free workflows are enabled from 100 ng of starting material. If library amplification is required, the HiFi PCR Master Mix and Primer Mix ensure even amplification with minimal bias. The streamlined workflow combines DNA polishing and adapter ligation in a single tube for rapid construction of libraries from fragmented DNA. An optional step using the HiFi PCR Master Mix and Primer Mix ensures even library amplification with minimal bias. 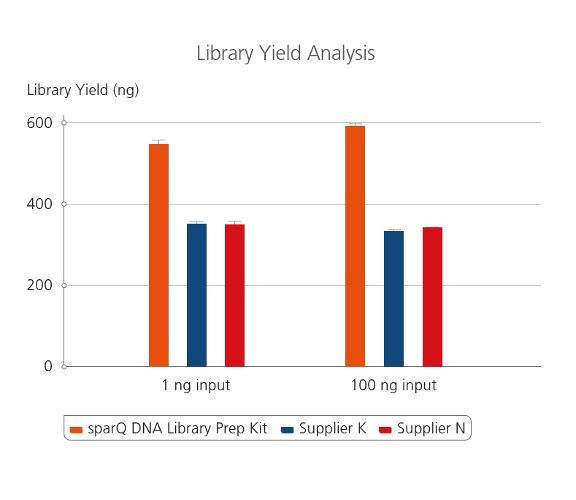 sparQ DNA Library Prep Kit produces high quality libraries from a broad range of DNA inputs with significantly higher yields. Libraries were prepared with Covaris-sheared human genomic DNA (250 bp average size) using kit manufacturers’ instructions. Amplified libraries (6 PCR cycles for 100 ng input DNA and 13 PCR cycles for 1 ng input DNA) were quantified with Qubit fluorometric method. PCR-free (dark blue) and amplified libraries (orange) were prepared from 100 ng of microbial genomic DNA of different species using sparQ DNA Library Prep Kit. Libraries were sequenced on Illumina MiSeq and 2 million sequencing reads from each library was analyzed. 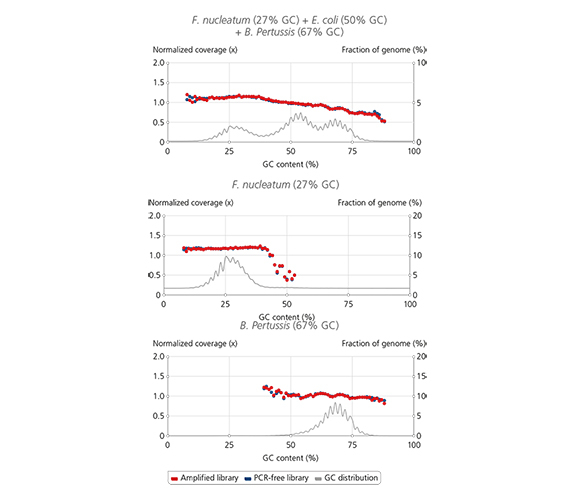 Coverage uniformity was examined by plotting normalized coverages of the library against GC-content of the targeted genome. GC-content distribution of targeted genomes is indicated by gray line. Both PCR-free and amplified libraries resulted in uniform coverage across a wide range of GC-content..
sparQ DNA Library Prep Kit generates high quality DNA libraries with minimal duplication rates. Libraries were prepared with 1 ng and 100 ng of microbial genomic DNA and subsequently sequenced on Illumina MiSeq. Each library was down-sampled to 2 million reads (150 bp paired-end reads) and aligned to a reference genome with only unique alignments reported. sparQ Adapter Barcode Sets A and B are single index barcoded oligonucleotide adapters designed for use with the Quantabio sparQ DNA Library Prep Kits in the construction of libraries for Illumina NGS platforms. Each sparQ Adapter Barcode Set contains 12 single index barcodes for 96 reactions.s. The streamlined workflow can be completed in under 3 hours with minimal hands-on time. A single tube is used for DNA polishing, ligation, and cleanup. A second tube is used for workflows requiring PCR amplification and a final tube receives the sequencing-ready library. 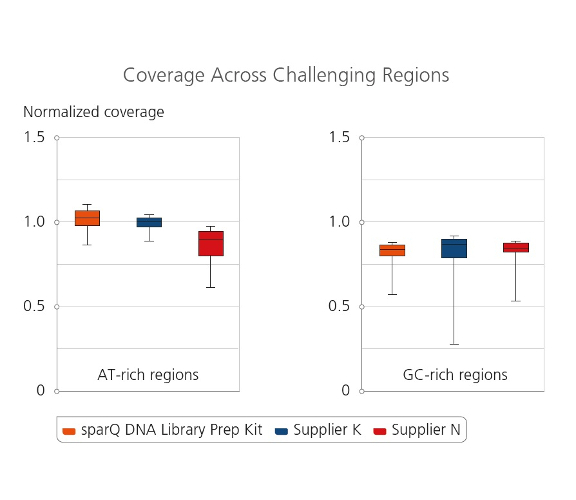 Library amplification with sparQ HiFi PCR Master Mix contained in the sparQ DNA Library Prep Kit resulted in uniform coverage across the wide range of GC-content. Libraries were prepared by using sparQ DNA Library Prep Kit with 100 ng input DNA. 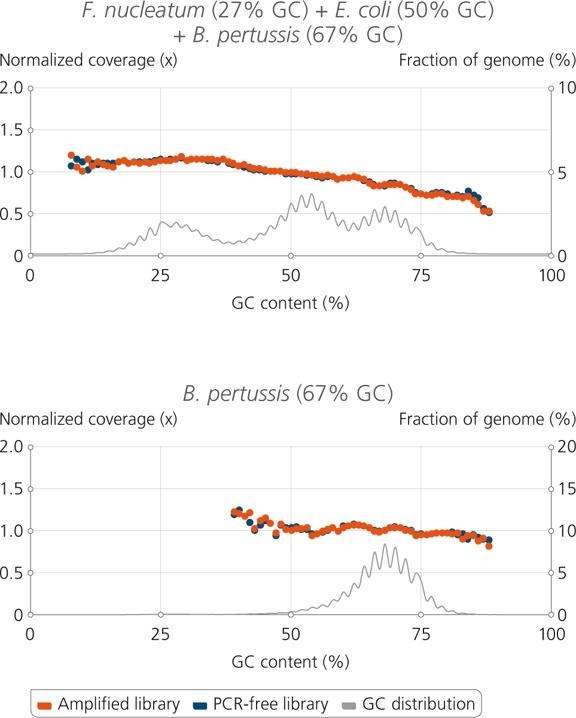 Coverage depth against GC-content of libraries amplified by sparQ HiFi PCR Master Mix (orange) were compared to corresponding libraries without amplification (dark blue: PCR-free library). GC content distribution of targeted genomes is indicated by gray line. Amplified libraries were prepared from 100 ng of microbial genomic DNA and subsequently sequenced on Illumina MiSeq. 2 million reads from each tested library were down-sampled and analyzed. 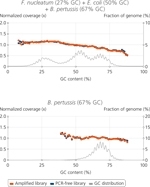 Coverage uniformity for different library preparation kits were compared by plotting normalized coverage for both extreme AT-rich regions (8%-20% GC-content) and GC-rich regions (75%-88% GC-content). sparQ DNA Library Prep Kit produces high quality libraries from a broad range of DNA inputs with significantly higher yields. Libraries were prepared with Covaris-sheared DNA (250 bp average size) using kit manufacturers’ instructions. 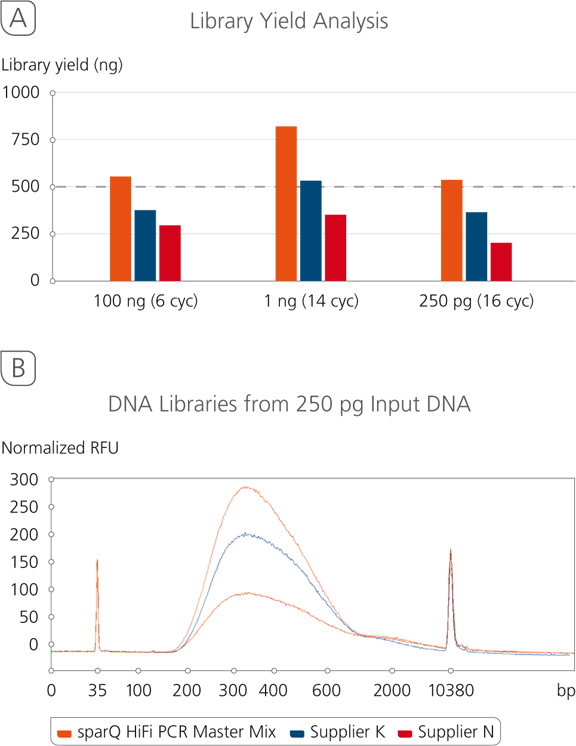 Amplified libraries (6 amplification cycles for 100 ng input DNA and 13 amplification cycles for 1 ng input DNA) were quantified with Qubit fluorometric quantitation method. Store kit components in a constant temperature freezer at -25°C to -15°C upon receipt. For lot specific expiry date, refer to package label, Certificate of Analysis or Product Specification Form.